On Tuesday, the tornado sirens in Nashville started screaming, and I ended up in my closet, clutching my laptop and my bowl of ramen noodles. I tweeted my fear, and I received comfort from loving friends and even a few strangers. Martha Bourke was one of those strangers, and she promised to “hold my hand” through the worst of it. It turned out to be a false alarm, as most tornado sirens are in my city. In the end, I left the closet floor with a new friend. Martha then agreed to answer my usual questions, and I can’t tell you how much this excites me. 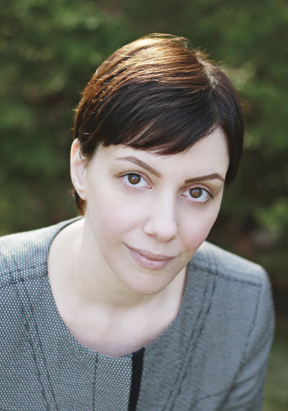 With a Young Adult novel focusing on the Mayan prophecy regarding the end of days, her work is timely and interesting. I hope you’ll take a moment to meet my new friend, Martha, and read about her first novel, Jaguar Sun. Jaguar Sun is the story of Maya Delaney, a sixteen year old high school junior of Mayan descent. As she and those around her begin to develop unexplained abilities, Maya learns that she is part of a worldwide plot much bigger than anything she could ever have imagined. She must harness her new found powers in time to fight off this evil and bring humanity through to a positive transition on December 21, 2012, the day that the Mayan calendar ends. Maya’s basically forced to reevaluate everything; her relationships, her identity, her whole place in our world. Oh, man. The first thing I remember writing was an acrostic poem using my first name in third grade. I was asked to read it in front of the school with other kids from each class. As if that’s not bad enough, after a read it, my old first grade teacher made a sour face and I saw her do it. Can you imagine? I mean, it may have been a tad bit morbid, but hello! I was NINE. Luckily, my fourth grade teacher, who was hands down the best teacher I ever had, encouraged me. She even tried to get some published in magazines. They never were, but I was hooked. Um, stripes. I’m not sure I could carry off plaid. Actually, I had no other option. I took a sabbatical because of a health issue in December 2010. I started the book in January and finished it in April 2011. I went to a conference in May. I had signed up for one of those manuscript critiques where an editor reads the first chapter in advance and then meets with you. He really liked it, but he basically said that because of the whole Mayan Calendar December 2012 issue, no trad publisher would touch it. It had an expiration date, literally. It takes them too long to get a book out. So, I spent the summer doing service work, not sure what to do with it. In the fall I sent the first chapter to Pedernales Publishing on a whim. They only work with Indie authors, but they also only accept about forty percent of the manuscripts they get. I called them and sent it in. A week later they sent me an e-mail asking for a phone call. They had accepted it, thank God. The first YA manuscript they had ever taken. They did the cover, the formatting, and my website. And we had it edited, proofed, formatted and out in two and a half months. Thank God only Book 1 has that kind of time constraint. 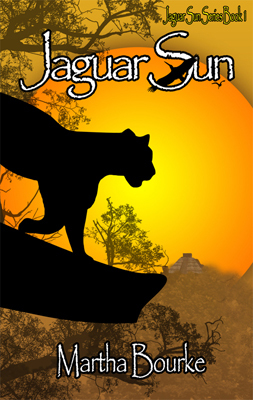 Jaguar Sun is the first book in the Jaguar Sun Series. I’m just starting to jot things down for Book 2, Jaguar Moon, which I’ll start very soon. It will be out in 2012. No, not really. I can’t write with music or the TV on. In little ways I suppose the people I know creep into my characters, but I’ve never flat out based an entire character on someone. Ha! That’s such a funny question to me because I’m never prepared enough to have that sort of thing. But I actually have a mini umbrella right now. It’s pink with white polka dots. I think it’s for breast cancer awareness. Charles Dickens, if I had to pick. That’s my mom’s fault. She’s big on the classics. Lots of Alcott and Austin. And my father was an English teacher. He taught American and British lit. So, there you go! But, Dickens was a genius. His characterizations are amazing. And he had a very hard life as a young man, which colored his work and made him a champion of the poor as an adult. Daughter of Smoke and Bone by Laini Taylor. I read it just before going into editing on my book in November. I haven’t had time since! Fabulous book, btw. I would love to have blue hair. I’m so Jealous. I write Paranormal, as opposed to Fantasy, so my world is our own world, but enhanced. My first novel I wrote five years ago took place locally. Jaguar Sun takes place in New Mexico and Mexico. I did a little research about New Mexico, and I knew a lot about Mexico already. But that’s not to say I wouldn’t travel if I need to! Sounds good, actually. I have a terrific reader’s circle and they actually read it in two halves. Then I have my editor, who I contract out for, gets started. She lives in CA and I live in MA, so we e-mail it back and forth using “track changes”. We talk on the phone. Then the work goes to Pedernales and we start talking proofing, cover, etc. This is probably not going to make any sense to anyone, but I was an elementary Spanish teacher for fifteen years. My knowledge of the Spanish language and Hispanic culture sort of smacked into my love of YA and that’s how the concept for Jaguar Sun was born. So an important song for the book is a song called “Tu Y Yo” (You and I) by Ricky Martin. It’s Matt and Maya’s theme song. And it has a very native feel to it at the end, which works perfectly for Maya’s character. The album came out while I was writing the book. At Amazon, in both Kindle and Paperback. It’s also at Barnes and Noble for Nook. Okay, just for you, Jen. I’m just going to pick one at random, okay? I turned and quietly opened the door to my and Matt’s room. He was sitting with his back to meon his side of the bed. As I watched, he leaned forward on his elbows, rubbing the stubble on his unshaven face as if deep in thought. I closed the door behind me with a quiet snick. “Matt? Are you okay?” I whispered. I walked over and sat down next to him. I stared at the floor, wondering what he could be thinking about me and this newest display of my freakish powers. I could feel a massive stress headache coming on. I rubbed my temples. “Are you okay?” he asked, putting an arm around me. Will that fateful day destroy our world, or did the Mayans have something else in mind? Maya Delaney is just an average sixteen-year- old. She’s busy dealing with exams, her soon to be ex-boyfriend and fitting in. But Maya’s got bigger problems. She’s hiding a major secret from her dad and having strange visions she can’t control. In her struggle to figure out who she is, she learns that she is meant to fulfill an ancient Mayan Prophecy and bring forth a New Age on earth. Will the spirit magic Maya wields be enough to defeat Toltec, an evil society bent on keeping her from her destiny? Or will that destiny destroy her? There you have it! Thanks for having me, Jennifer. And thank you to readers who are taking a chance on a new author and letting my characters into their lives for a bit. That’s the best thing about writing after all. And a huge thanks to Martha for stopping by. I hope you’ll take a moment to find her on Twitter, visit her Facebook page, and become a fan on GoodReads. You can also learn more about Jaguar Sun on the website, and follow her blog.